Seniors who want to participate in the graduation walk on May 18th need to turn in their permission slips to Mrs. Gardner or Mrs. Clark by the end of the day TODAY. REMINDER FROM THE CAFETERIA: Starting in May, you will NOT be able to charge to your lunch account. Seniors (and juniors graduating early): Please see Mr. Kissinger during his lunch duty TODAY to go over the correct pronunciation of your names for the graduation register. This will also be your opportunity to let him know if you do or do not want middle names or your full first name read. Auditions for next year’s choirs are taking place this week and next week, ending on May 5th. If you are interested in auditioning please come to the choir office in room 5310 to find out more information or to schedule an audition time. Attention One Act Directors, Cast and Crew: There is a VERY important brief meeting Monday at 3:45 p.m. in the auditorium. Please plan to attend! Prom tickets are on sale now during all lunches! Sale dates are TODAY, May 2nd-5th and May 9th-12th. Morning ticket sales will be on May 4th and May 12th from 7:45-8:15 a.m. Tickets are $40 each and will increase to $45 starting May 9th. Are you a DACA student that wants to go to college? Please join us May 9th during both SRT sessions in the auditorium. Discover how you can make college possible by learning from DACA students from IU Bloomington! Eres un alumno indocumentado o DACA que quiere ir a colegio? Favor de unirse a nosotros este 9 de Mayo durante ambos sesiones de SRT. 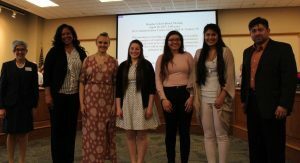 Descubre cómo puedes ser colegio posible, aprendiendo de otros alumnos indocumentados y con DACA desde la Universidad de Indiana en Bloomington! 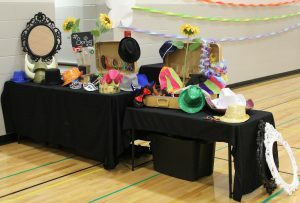 Juniors and Seniors: Have you registered yet for the prom package courtesy of the Interra Credit Union RedHawks branch? The winner gets two prom tickets (or reimbursement for tickets already purchased), a $75 gift card to the restaurant of your choice and $50 cash for those extra expenses. Stop by the Interra RedHawks branch to get all the entry details TODAY and next Wednesday from Ailynn and Tricia. The winner will be announced May 5th. We’ll see you at the RedHawks branch! The GHS Color Guard will have tryouts and training sessions at GOSHEN MIDDLE SCHOOL starting May 2nd. The practices will be from 4:00-6:00 p.m. every Tuesday, Wednesday and Thursday for four weeks from May 2nd thru May 25th. Meet by Door Y in the front circle. Hey, GHS students and staff…..Do you want to show your RedHawk Pride? Purchase a RedHawks bumper sticker! They will be available in the commons area during all lunches TODAY. The stickers are weather-proof and removable and are available in three designs. The cost is just $2 for a small sticker and $4 for a large one. Proceeds will benefit Key Club and The Ultimate Frisbee Club. IHSAA Student-Athlete Tip of the Week: Zak Keefer of the Indy Star wrote about NFL legend Peyton Manning and how he spent part of his off season every summer working on basic fundamentals with his brother Eli, under his former college quarterback coach. Peyton was quoted as saying, “Don’t think you ever got it all figured out, because the little things matter. And if you ever think the little things don’t matter, and you can brush those aside, I promise you in whatever you are doing, your game’s going to slip.” So the next time you spend a big part of your practice working on fundamentals, or your coach encourages you to do so in the off season, recognize the importance. Manning did so for his entire career! NOW HIRING: Walmart is now hiring for the new Elkhart Rd. Super Center. To apply go to apply at Walmart.com or come into the store to the hiring center and apply on the kiosk. Make sure to note that you are applying for the Elkhart Rd. location. HELP WANTED: If you are 18 years old, and are interested in lawn care and landscaping Twin Pines is looking for a full time employee to start immediately. To apply, please stop by their office at 2011 W. Wilden Ave. in Goshen to fill out an application. Seniors: (**Please note the date change**) If you still need to order a cap and gown you can visit their web site at www.highschool.herffjones.com to place an order. Cap & Gown delivery day will be on May 4th during SRT. 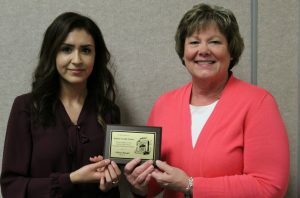 The guidance office has just received the Dee Watson Nursing Scholarship. Stop in to pick up an application. Judged cheerleading tryouts will take place in the warehouse TODAY starting at 6:00 p.m. If you are a spring athlete who could not make it today, please come on Saturday starting at 9:00 a.m.
Any boy interested in playing football in the fall should attend a call out meeting on Tuesday, May 9th during the 2nd session of SRT in the main gym. Updated calendars will be passed out, expectations will be laid out and we will go over some important info regarding the summer. Please plan to attend! The girls tennis team had their first 0-5 loss of the season to Concord. Courtney Sloop and Madison Rittenhouse got a doubles win for JV. The boys varsity golf team defeated Central Noble 194-223. The RedHawks were led by Allan Garratt who fired a 46. Jake Jennette and William Troyer shot 48s and Gabe Yoder and Peyton Cripe shot 52s. There was no JV match because Central Noble could not field a JV team. The girls varsity softball team jumped out early leading 2-1 in the 4th, but couldn’t hold the lead and lost to Mishawaka 9-2. Alexia Nettrouer had two hits and a double while Kate Atkinson also added two hits for the night. The girls JV softball team defeated Mishawaka 21-4. Ruth Whitehead got the win as the pitcher while Alexis Navarro had three hits including a three run homer and while adding six RBI’s. Breanna Boocher also had two hits including a two run homer with three RBI’s. Vanessa Lopez and Sarai Rodriguez each added two hits. Maddie Cross also had two doubles for the day. The girls JV and varsity tennis teams will host Westview at 5:00 p.m. The boys and girls varsity track teams will compete in the John Reed Relays at 9:00 a.m. The boys baseball C team will host Plymouth in a double header starting at 10:00 a.m. The students in Mr. Ken Cross’s Goshen High School Interdisciplinary Cooperative Education (I.C.E.) program met for lunch on Thursday, April 27th to celebrate a year of classes and on-the-job training. 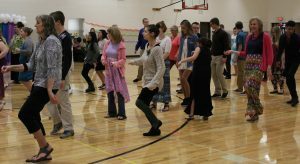 This educational option, which is a part of work-based learning, has been in place at GHS for quite some time, but it will change starting with the 2017-18 school year. Instead of I.C.E. 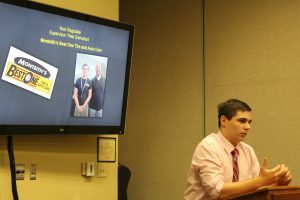 or Internships, students will be able to choose from an Internship or an Apprenticeship, which will last for one semester. In an apprenticeship, students will work under someone who is qualified in the field of their interest. Depending on the job placement and the length of the training, students will have the potential to graduate with certification in their chosen field. Mr. Cross spoke a little bit about the program “by the numbers”. He said that last year 22 students started the program at the beginning of the year, but only 9 students completed the whole year. Those students worked just over 10,000 hours and earned over $84,000. This year, 16 students started the program in August, and 14 students completed the whole year. 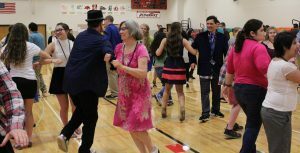 They also worked over 10,000 hours, and have so far earned $93,000 for the year, with the potential to earn $100,000 before the end of the school year. Additionally, each student is required to work 540 hours over the course of the school year, which averages out to 15 hours per week. This year’s class has averaged closer to 19 hours per week, and they each represent 9 continuous months of employment. 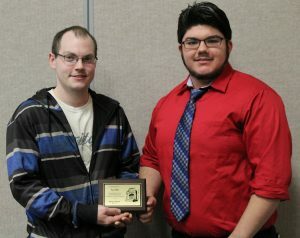 (In March) “Much improvement” And, the student was given a perfect score! At work, he learned how to operate a forklift, how to manage a route, and how to service the machines if it was a relatively easy fix. In the classroom, he learned about many financial principles including budgeting, insurance, and how to plan for the future. 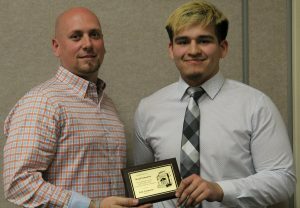 He will graduate in June, and plans to attend the University of Indianapolis where he will play football and study business and marketing. At work, he learned how to safely use power tools, the importance of teamwork and communication among team members, and the importance of being at work on time. In the classroom, he learned about budgeting and investing for his future. 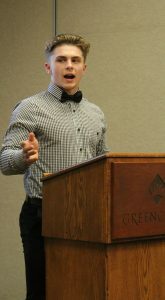 He will graduate in June, and will study business at IUSB. 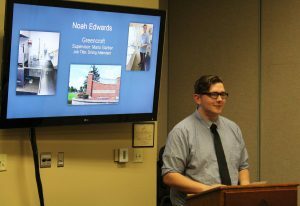 At work, Noah served food, washed dishes, and served the Greencroft residents. He learned how to work the cash register and how to have patience with co-workers and residents. In the classroom, he learned the importance of saving, budgeting, how interest adds up over the years, and how to do his own taxes. Noah will graduate in June and plans to join the Marines. 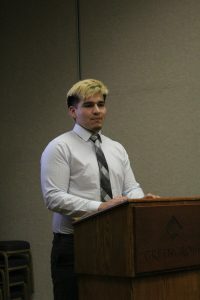 At work, Diego said he learned how to deal with people, and to take a leadership role. In the classroom, he learned how to deal with credit and how to save for the future. 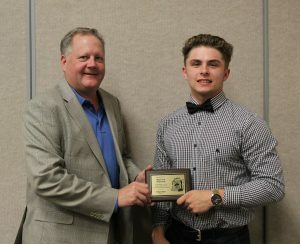 He thanked Mr. Cross for being flexible with him during football season as it was hard to manage school, work, and athletics. At work, Cheyenne worked as a drafter, and drew up site plans for buildings, including layout for electrical and plumbing. She also learned a lot about many regulations in the field. In the classroom, she learned how to do her own taxes and how to budget. 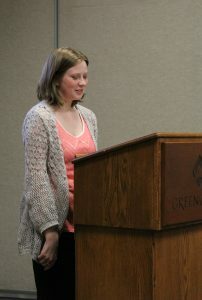 She stated that because of what she has learned, she has saved enough money to pay for her first year of college. 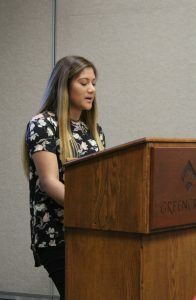 She will graduate in June and plans to attend Ball State for Architecture. Bethanie worked as a dining attendant at Greencroft, serving residents and working in the kitchen. In the classroom, she learned a lot about taxes, insurance, and budgeting. She will graduate in June, and wants to attend college to be a nurse. Josselyn worked as a hostess and a waitress, where she learned the positives and negatives of working in a service industry. In the classroom, she learned about saving for retirement, budgeting, managing her money, and being prepared. 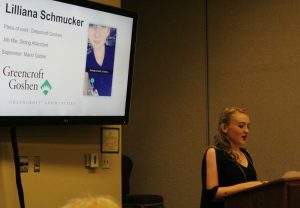 She will graduate in June, and will attend Ivy Tech for Dental Hygiene. 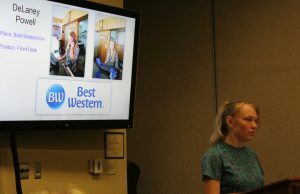 DeLaney worked at the front desk at the Best Western, taking reservations and registering guests. She said that her job helped her improve both her computer and problem-solving skills. 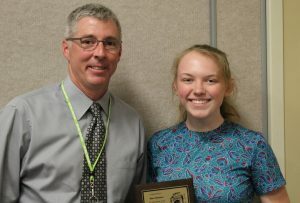 In the classroom, she said that she learned a lot about finances, and that Dave Ramsey (who has written books on personal finances) is now “basically one of my best buddies”. 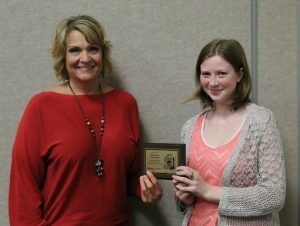 DeLaney will graduate in June and plans to attend college. At work, Nick was employed as a tire tech, but also learned more about basic auto repair. He also learned to keep his work space clean, to be a team player, and more about the automotive vocabulary. 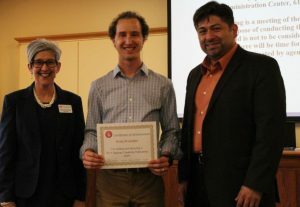 In the classroom, he learned a lot from the Dave Ramsey series, and also about budgeting, keeping an emergency fund, keeping yourself accountable, and how to do taxes. 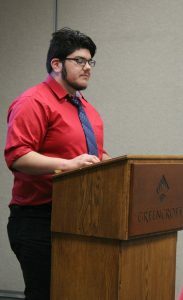 Nick will graduate in June, and plans to use what he has learned to work on military vehicles. 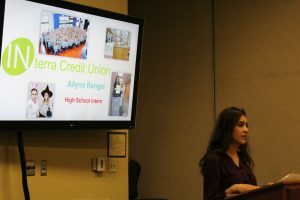 Ailynn has worked in the RedHawks branch of Interra, where she learned how to do deposits and transactions, to balance her drawer at the end of the day, and how to provide good customer service. In the classroom, she learned strategies to develop and stick with a budget, and how to interview for a job. 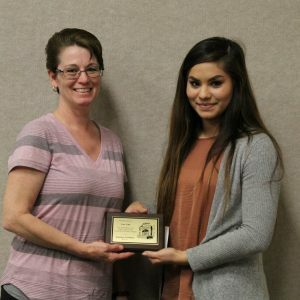 Upon graduation in June, she plans to continue her employment with Interra and pursue a business degree. In her job, Jessica worked with students in the classroom, reading to them and helping them with projects. She also did things like making copies for the classroom. In the classroom, Jessica learned about debit and credit cards and about budgeting. Following graduation, she will attend IUSB to study elementary education. Lilliana also worked as a dining attendant, where she worked in the pantry, washed dishes, stocked items, and served Greencroft residents. She said that she learned to have compassion for other employees and for the residents, and said “If you can make residents smile, you’ve done a good job”. She also noted that communication is a key with your employer. In the classroom, she learned about investing, and that budgeting will help you plan for your future. After graduation, she would like to attend college to become a pediatrician. 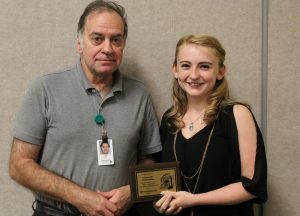 For the summer, she plans to get her CNA and continue working at Greencroft. W2 has worked as a cook at Bob Evans. In the classroom, he said that he learned a lot about investments, and the different types of investments a person can make. He also developed an understanding of debt, which led him to cut up his credit card and only spend money if he had cash. 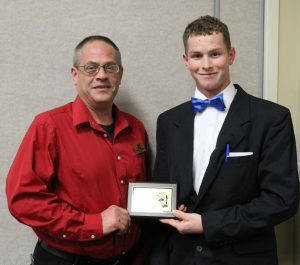 He will graduate in June, and plans to enlist in the Marines. What a great group of students/employees! 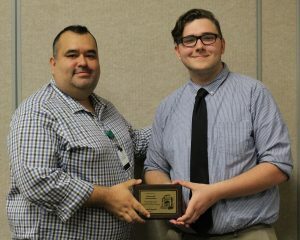 Thank you to Ken Cross for leading and instructing them this year, and to the employers in our community who provide this valuable learning experience for our students. Seniors who want to participate in the graduation walk on May 18th need to turn in their permission slips to Mrs. Gardner or Mrs. Clark by TOMORROW. Seniors (and juniors graduating early): Please see Mr. Kissinger during his lunch duty TOMORROW to go over the correct pronunciation of your names for the graduation register. This will also be your opportunity to let him know if you do or do not want middle names or your full first name read. Prom tickets are on sale now during all lunches! Sale dates are now through April 28th, May 2nd-5th and May 9th-12th. Morning ticket sales will be on April 27th, May 4th and May 12th from 7:45-8:15 a.m. Tickets are $40 each and will increase to $45 starting May 9th. Juniors and Seniors: Turn your dreams into reality! You have a chance to win a great prom package, courtesy of the Interra Credit Union RedHawks branch. The winner gets two prom tickets (or reimbursement for tickets already purchased), a $75 gift card to the restaurant of your choice and $50 cash for those extra expenses. Stop by the Interra RedHawks branch to get all of the entry details TOMORROW and next Wednesday from Ailynn and Tricia. The winner will be announced May 5th. We’ll see you at the RedHawks branch! Hey, GHS students and staff…..Do you want to show your RedHawk Pride? Purchase a RedHawks bumper sticker! They will be available in the commons area during all lunches this TODAY and TOMORROW. The stickers are weather-proof and removable and are available in three designs. The cost is just $5 for a large sticker and $2 for a small one. Proceeds will benefit Key Club and The Ultimate Frisbee Club. Judged cheerleading tryouts will take place in the warehouse TOMORROW starting at 6:00 p.m. If you are a spring athlete who could not make it on Friday, please come on Saturday starting at 9:00 a.m. The boys varsity baseball team defeated Concord 8-1. Tyler Colpitts threw a seven inning complete game on 79 pitches to improve to 5-0 on the season. Tyler allowed only three hits and improved his opponent’s batting average to .160 on the season. Offensively, Trenton Scott had two doubles and two RBI’s. CJ Detweiler also had two hits and Charlie Collins a two RBI double. The girls varsity softball team won against Concord, 4-2. Kate Atkinson went the distance only giving up four hits and had six strike outs. AnaMaria Ramirez had a triple and drove in one run. Gracie Hayes also had a hit with two RBI’s. The girls JV softball team won in thrilling game in the bottom of the 10th vs. Concord ending with a score of 3-2. Grace Vance got the win in the circle striking out six. Breanna Boocher hit a two out triple to tie the game in the bottom of the 7th. Sarai Rodriguez drove in the winning run in the 10th with a RBI single. The boys JV baseball team surrendered 16 runs in the loss to the Concord Minutemen, ending with a score of 16-10. Although the offense scored ten runs, the RedHawks could not overcome a shaky defense. Eric Newell and Porter Revoir each had two hits and Bryant Robinson, Newell and Bryce Smith all added two RBIs for the offense. The girls JV and varsity softball teams will play at Mishawaka at 5:00 p.m. The girls JV and varsity tennis teams will play at Concord at 5:00 p.m. The boys JV and varsity golf teams will compete against Central Noble at 5:00 p.m. Seniors who want to participate in the graduation walk on May 18th need to turn in their permission slips to Mrs. Gardner or Mrs. Clark by the end of this week. Seniors (and juniors graduating early): Please see Mr. Kissinger during his lunch duty this Friday to go over the correct pronunciation of your names for the graduation register. This will also be your opportunity to let him know if you do or do not want middle names or your full first name read. Juniors and Seniors: Turn your dreams into reality! You have a chance to win a great prom package, courtesy of the Interra Credit Union RedHawks branch. The winner gets two prom tickets (or reimbursement for tickets already purchased), a $75 gift card to the restaurant of your choice and $50 cash for those extra expenses. Stop by the Interra RedHawks branch to get all of the entry details TODAY, and again this Friday and next Wednesday from Ailynn and Tricia. The winner will be announced May 5th. We’ll see you at the RedHawks branch! Hey, GHS students and staff…..Do you want to show your RedHawk Pride? 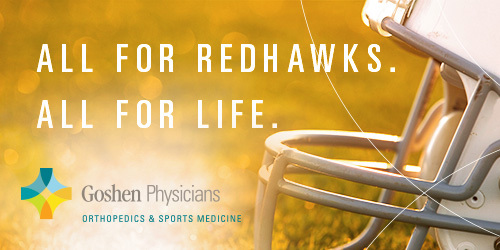 Purchase a RedHawks bumper sticker! They will be available in the commons area during all lunches this Thursday and Friday. The stickers are weather-proof and removable and are available in three designs. The cost is just $5 for a large sticker and $2 for a small one. Proceeds will benefit Key Club and The Ultimate Frisbee Club. Students who are interested in GHS’ annual trip to Stratford, Ontario for an inspiring weekend of theater should check with their English teacher or, alternatively, stop by Mr. Caskey’s room (3180) or email him at lycaskey@goshenschools.org for more information. We hope you join us! Judged cheerleading tryouts will take place in the warehouse on Friday starting at 6:00 p.m. If you are a spring athlete who could not make it on Friday, please come on Saturday starting at 9:00 a.m. The girls track team lost to Elkhart Memorial 55-77. Goshen had some great performances and was led by Kassandra Rodriguez’s 1st place finish and Suzette Rodriguez’s 2nd place finish in shot put, Riley Martin’s 2nd place finish in discus, Jill Kissinger’s 1st place finish and Kyrah Fletcher’s 3rd place finish in long jump, Kayleigh McKee’s 1st place finish in pole vault, Kirsten Graves’ 2nd place finish and Ashley Sanchez Gonzalez’s 3rd place finish in the 3200, Alayna Yoder’s 3rd place finish in the 200, Jocelyn Valderrama’s 2nd place finish in the 800, Jill Kissinger’s 1st place finish and Kayleigh McKee’s 2nd place finish in the 300 Hurdles, Brandi Smith’s 1st place finish in the 400, Jocelyn Valderrama’s 2nd place finish and Ariana Perez Diener’s 3rd place finish in the 1600, and Jill Kissinger’s 1st place finish and Kyrah Fletcher’s 2nd place finish in the 100 Hurdles. The girls tennis team fell 1-4 to Northwood. Lineth Alvarez battled back from being down 0-5 in the 2nd set tiebreaker to win it 9-7 and improve to 8-0 on the season. Katia Gutierrez, Sydney Penner, Sophia Kellenberger, Maiah Huffman, Sage Christner, Sophia Kirkton, Courtney Sloop, and Madison Rittenhouse all won a match for the JV squad. The boys JV and varsity track teams will compete against Concord and Warsaw at 5:30 p.m. in Warsaw. 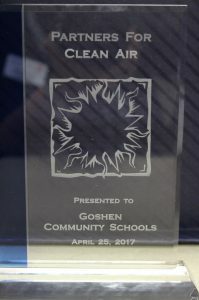 Goshen Community Schools received a Partners for Clean Air Award on Thursday, April 25 at a luncheon hosted by Michiana Area Council of Governments (MACOG). 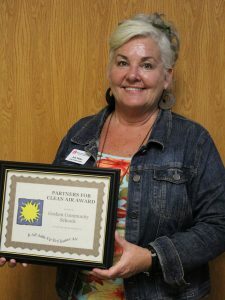 GCS Energy Educator Judy Miller accepted the award on behalf of the school corporation. 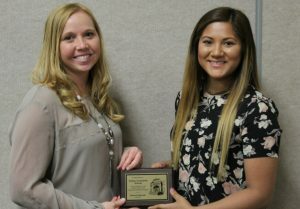 Goshen Community Schools received recognition for the corporation-wide energy conservation program that was first implemented in 2009. Because of staff participation and cooperation with energy conservation measures, GCS has been able to decrease energy costs/consumption by 25.3%. That translates into $3,441,313.00 in cost avoidance for Goshen schools! Energy reduction is 142,921 MMBTUs, (equivalent to a reduction of 22,459 metric tons of CO2; which is the equivalent to 4,679 cars not being driven for one year and 575,878 tree seedlings being grown for 10 years!). Part of Mrs. Miller’s job is to educate staff members and students on what each person can do to make a difference. Along with education, she monitors the corporation’s utility bills and, with the help of maintenance and custodial staff, also monitors the many corporation buildings to ensure that everything is running as efficiently as possible. GCS also received praise for implementing project-based learning in our elementary and middle schools, which allows students to enter into hands-on projects that study energy utilization and conservation. New Tech classes at both Model and GMS have worked with Mrs. Miller on energy-related projects this year. Public schools must all make tough choices regarding where to direct their limited financial resources. I help free up budgets using energy optimization solutions with verifiable results, allowing administrators to invest savings in students and their teachers so they can succeed. Thank you to Mrs. Miller, and to everyone at GCS who helps ensure that we use our resources wisely and responsibly! Prom tickets go on sale TODAY during all lunches! Sale dates are TODAY through April 28th, May 2nd-5th and May 9th-12th during all lunches. Morning ticket sales will be on April 27th, May 4th and May 12th from 7:45-8:15 a.m. Tickets are $40 each and will increase to $45 starting May 9th. Cheerleading fall season tryout practices began this week. We will meet again TODAY from 6:30-8:00 p.m. Judged tryouts will take place in the warehouse on Friday starting at 6:00 p.m. If you are a spring athlete who could not make it on Friday, please come on Saturday starting at 9:00 a.m. The unified track and field team travelled to East Noble on Friday to take on Central Noble, East Noble and Bremen. The team participated in several events and had many people beating their personal best for the season. In the 100m dash, Chase Brown (11) beat his personal best with a time of 13.9seconds. In the 100m wheelchair dash, Nate Elliott (9) and Jesse Rhoades (11) took second place. In the 400m dash, Zach Templeton (11) beat his personal best with a time of 1:10 and Laura Scott took 2nd in her heat and beat her personal best with a time of 1:17 in what was a very competitive race. The 4x100m Relay team of Spencer Witmer, Jesse Rhoades, Laura Scott, and Zach Templeton came in with a faster time than last season with a time of 1:05. In the shotput, Laura Elliott (10) took first in her flight and beat her personal best with a distance of 16’1’’. Long Jumpers Austin Peeler (10) and Austin Hardesty (12) took first and second in their flights with distances of 9’9’’ and 11’7.5’’ respectively (a personal best for Hardesty). Laura Elliott (10) took second in her long jump flight with a personal best distance of 6’7’’. Lexi Witmer (12) took second in her long jump flight with a distance of 2’8’’. The Redhawks will host their next meet on May 5th at 5:30 p.m. The boys varsity baseball team defeated Plymouth 6-2. Joey Peebles got the win on the mound giving up one run in five plus innings with six strikeouts. Chase Knoblock picked up his 3rd save in as many games and stranded two inherited runners in the 6th. Michael Pinarski contributed two hits for the offense. The boys JV baseball team lost to Plymouth 5-2. Plymouth jumped out to a 5-0 lead and it was too much to overcome for the RedHawks. The RedHawks had seven players each with one hit, but were unable to overcome the early deficit. Jude Fitzgerald and Bryce Smith both had RBI’s for the RedHawks. The girls JV softball team defeated Plymouth 20-4. Grace Vance picked up the win in relief. Mykayla Snyder had two hits and four RBI’s while Alexis Navarro also added two hits and four RBI’s. Lindsey Camacho had two hits while scoring five runs. The girls varsity softball team defeated Plymouth 6-0. Kate Atkinson got the win and shutout while giving up five hits and nine strike outs. AnaMaria Ramirez went two for two with her 1st career home-run while adding three RBI’s. The boys baseball C team will host Mishawaka at 5:00 p.m. The girls JV and varsity tennis teams will compete at Northwood at 5:00 p.m. The girls JV and varsity track teams will host Elkhart Memorial at 5:30 p.m. Seniors who want to participate in the graduation walk on May 18th need to turn in their permission slips to Mrs. Gardner or Mrs. Clark by the end of April. Prom tickets go on sale TOMORROW during all lunches! Sale dates are TODAY through April 28th, May 2nd-5th and May 9th-12th during all lunches. Morning ticket sales will be on April 27th, May 4th and May 12th from 7:45-8:15 a.m. Tickets are $40 each and will increase to $45 starting May 9th. Congratulations to the students of the Goshen Bands and Orchestras as they performed beautiful music at the ISSMA High School Organizational Festival at Northridge High School Friday night. 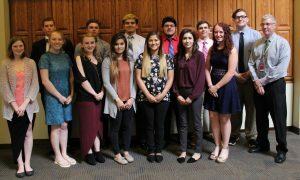 The Concert Band, Crimson Concert Orchestra, and Philharmonic Orchestra performed for three state adjudicators and all ensembles received Gold Ratings. All three ensembles also received gold ratings in the sight-reading event which takes place immediately after their prepared performance and tests the students on their music literacy. The Symphonic Orchestra, Men’s Choir, Symphonic Band, Advanced Choir, and Wind Ensemble will travel to Chesterton this Saturday to participate in the state qualification event with high hopes of once again qualifying our ensembles for the 2017 state concert finals event. Thank you to everyone who participated in the blood drive! Cheerleading fall season tryout practices begin this week TODAY and TOMORROW from 6:30-8:00 p.m. Judged tryouts will take place in the warehouse on Friday starting at 6:00 p.m. If you are a spring athlete who could not make it on Friday, please come on Saturday starting at 9:00 a.m. The girls tennis team snapped their skid with a 3-2 win over West Noble. Lineth Alvarez improved to 7-0 and Cheyenne Kalb improved to 5-1, but the match was clinched in a 2nd set tiebreaker for Kayleigh Crowder at 1 Singles. Greta Lapp Klassen had an 8-1 win at 1 Singles for a short-handed JV squad. The boys varsity baseball team defeated Elkhart Memorial 3-1. Tyler Colpitts gave up only one hit over six innings of work as he improved to 4-0 on the mound for the season. Chase Knoblock earned his second consecutive conference save retiring all three hitters he faced in the 7th. Offensively Michael Pinarski had a single and a double and Chava Garcia and Philip Wertz both doubles. The girls JV softball team defeated Memorial 13-0 to improve to 4-3 overall. Grace Vance was the winning pitcher and only allowed three hits and had seven strike outs. Heather Goertzen had one hit and two RBI’s while Breanna Boocher also had a hit and added two RBI’s. Maddie Cross had a double and scored three times. The girls JV softball team defeated Elkhart Memorial 5-4. Elkah DeVoe had two hits and two RBI’s while Gracie Hayes also had two hits and her first varsity career triple. The boys JV baseball team hung on against a late Elkhart Memorial rally to win their first conference game of the season, 5-4. Braxton Kincaid pitched four innings of shutout baseball before being chased out of the game in the 5th inning. Bryant Robinson was able to shut down the rally from the Chargers to help close the game for the RedHawks. Robinson also contributed to the offense with two hits. Jude Fitzgerald and Drew Marlow contributed RBIs for the RedHawks. The girls JV softball team defeated Prairie Heights 10-5 in game 1 of a double header. Ruth Whitehead got the win in the circle. Alexis Navarro had two hits and three RBI’s. Lindsey Camacho had two hits while Devin Shipley had one hit and two RBI’s. In game 2 the RedHawks lost 9-5. Sarai Rodriguez had one hit with two RBI’s, while Maykayla Snyder added a hit and one RBI. Breanna Boocher also added two hits. Goshen varsity boys golf competed in the Lakeland Invitational at Heron Creek GC in LaGrange. The RedHawks finished 7th of 12 teams with a team score of 395. Goshen was led by Junior Peyton Cripe who went out in 49, but shot 38 on the back for a total of 87. Jake Jennette shot a 97, Gabe Yoder 105, Allan Garratt 106 and Martin Lyrvall 122. Goshen JV boys golfers competed in the Plymouth JV Invitational at Pretty Lake CC in Plymouth. Goshen was led by Ben Schneider with a 109, Joseph Narayan 126, Don Perry 129, Zane Barker 157 and Zack Barker 159. The JV girls tennis team placed 3rd at the Plymouth Invitational on Saturday. Katia Gutierrez at 2 Singles, and Courtney Sloop and Madison Rittenhouse at 2 Doubles, were runners-up at their positions. Greta Lapp Klassen finished 3rd at 1 Singles. The boys JV and varsity baseball teams will host Plymouth at 5:30 p.m. The girls JV and varsity softball teams will play at Plymouth at 5:30 p.m.
Congratulations to the Advanced Crimson Chorale (10-12 grade auditioned women, directed by Stutzman), the Crimson Choir (9-12 grade non-auditioned mixed, directed by Snyder) and the Crimson Chorus (9 grade women, directed by O’Leary) who all earned gold ratings at ISSMA district contest last night at Concord High School. Choirs performed 3 concert pieces, adjudicated by 3 judges, and were evaluated on Sight-Reading by a 4th judge. Congratulations to all students who participated! Congratulations to the Advanced Crimson Chorale (10-12 grade auditioned women, directed by Stutzman), the Crimson Choir (9-12 grade non-auditioned mixed, directed by Snyder) and the Crimson Chorus (9 grade women, directed by O’Leary) who all earned gold ratings at our ISSMA district contest last night at Concord High School. Choirs performed three concert pieces, adjudicated by three judges and were evaluated on Sight-Reading by a 4th judge. Congratulations to all students who participated! IHSAA Student-Athlete Tip of the Week: Have you ever had a coach make the comment to you or a teammate by saying the words “you are thinking too much”? If so, what would those words mean to you? It more than likely means that you are “overthinking” or not playing by natural instincts. Sports are played best by those who think less and play naturally. In other words, a baseball or softball player might overthink their time at bat by waiting for a perfect pitch. Regardless of the sport, there is always a scenario where “overthinking” is a detriment, rather than a plus. Try to relax in those stressful situations and rely on those natural instincts. Focus on your role, your training and how your coach has instructed you. If you block out all other distractions, you will be free to play to your best ability and do what comes naturally! Thank you to everyone who has signed up for today’s blood drive. Please make sure to check your email for important information. Cheerleading fall season tryout practices will begin on April 24th and 25th from 6:30-8:00 p.m. Judged tryouts will take place in the warehouse on Friday, April 28th starting at 6:00 p.m. If you are a spring athlete who could not make it on the 28th, please come on Saturday, April 29th starting at 9:00 a.m. The girls tennis team lost another 2-3 match, with points coming from Lineth Alvarez-Barrera at 2 Singles and Cheyenne Kalb at 3 Singles. Lineth improved to 6-0 on the year. Katia Gutierrez-Avila score the lone point for JV with an 8-1 win. Unified track and field has their first meet of the season at East Noble starting at 5:00 p.m. Girls JV and varsity tennis will compete at West Noble at 4:45 p.m. The boys JV and varsity baseball teams will play at Elkhart Central at 5:30 p.m. The girls JV and varsity softball teams will host Elkhart Central at 5:30 p.m. The boys varsity golf team will compete in the Lakeland Invitational at Heron Creek at 8:00 a.m. The boys varsity track and field will host the Goshen Relays starting at 9:00 a.m. The boys JV golf team will compete in the Plymouth Invitational at 9:00 a.m. The girls JV tennis team will compete in the Plymouth Invitational at Culver at 9:00 a.m. 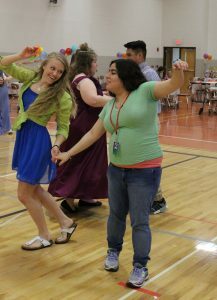 The girls JV softball team will compete in a double header at Prairie Heights at 9:00 a.m.
Today was the annual GHS Prom for local Life Skills students. 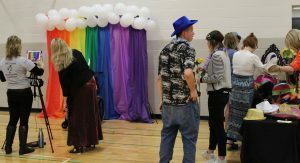 This event began several years ago when a Life Skills teacher advocated for her students to experience the same excitement and anticipation of prom as every other high school student. 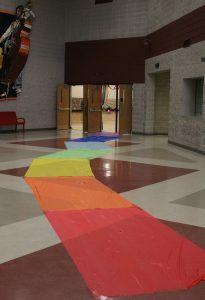 Since that time it has become an annual event, and it is a favorite for many students and staff at GHS. 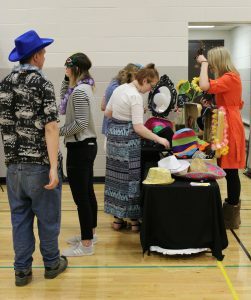 Students from Northridge, Northwood, Concord, and the Goshen Young Adult Program joined the GHS class for a catered lunch, followed by pictures in a photo booth, and dancing. 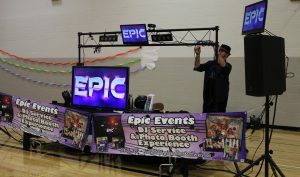 The photo booth and music was provided by Epic Events (Ross and Heidi Elias) who provided their services at a reduced cost, and were absolutely wonderful to our students. 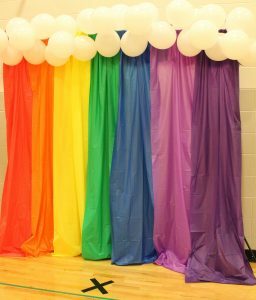 The prom is planned by the GHS student council and their sponsor, Guidance Counselor Jaimie Pierce. 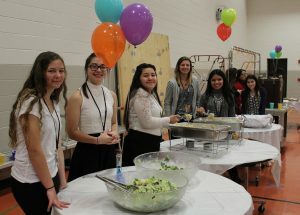 Ms. Pierce said that the student council volunteers by putting up decorations, serving the meal, helping with the photo booth, and making sure everyone has someone to dance with, and is having a great time. 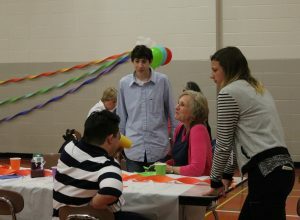 She said there were also students beyond the student council who volunteered to help because they know the Life Skills students and they wanted to help make their day special. 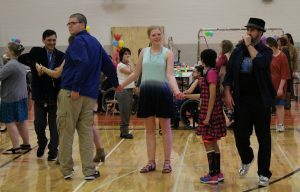 As you may be able to tell from the pictures, a very good time was had by all of those in attendance. Thank you to everyone who made this day a day worthy of the weeks and months of anticipation. We are already looking forward to next year! Thank you to everyone who has signed up for tomorrow’s blood drive. Please make sure to check your email for important information. If anyone else would still like to sign-up, see Mrs. Clark in room 2280. The boys varsity baseball team defeated Warsaw 12-9. Austin Cain improved his record on the mound to 3-1 with 6 1/3 strong innings, three K’s and zero walks. Chase Knoblock recorded a two out save. The offense was led by Robbie Riegsecker with three hits including a homerun, double and five RBI’s. Michael Pinarski also had three hits with a triple and four runs scored. The girls varsity softball team lost to Warsaw 10-5. Elkah DeVoe had two hits for the night with two stolen bases for the RedHawks. Sara Breniser also added a double which was her first one of her varsity career. The boys JV baseball team dropped their 2nd conference game this week at Warsaw High School by a score of 4-3. The RedHawks took a 3-0 lead into the final inning but were unable to close as Warsaw struck for four runs in the bottom of the 7th. Bryce Smith pitch 6 1/3 innings for the RedHawks and only gave up one run. Bryant Robinson had two RBI’s leading the offense. The girls JV and varsity tennis teams will play at John Adams at 5:15 p.m. The boys JV and varsity track and field teams will host Plymouth at 5:30 p.m. The girls varsity softball team will play at East Noble at 5:30 p.m. 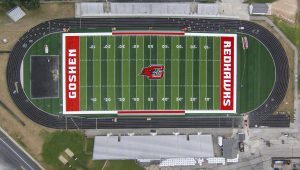 The Goshen High School Graduation will be held on Sunday, June 4th at 2:00 p.m. in the main gym. GHS is once again issuing tickets for the graduation ceremony, and each person (including babies who will be held during the ceremony) will need a ticket in order to get into the gym for graduation. On graduation day the doors will open at 12:30 p.m. If you have tickets, you will be able to enter the gym after that time. GHS will also broadcast the graduation ceremony via closed circuit TV in the GHS Auditorium. If guests do not have tickets, and are planning to watch the ceremony in the auditorium, they should enter the school at Door M. Guests with tickets may enter the building at Door M (the main entrance on the west side of the building) or Door B (on the east U.S. 33 side of the building). There will be general parking available in the GHS parking lot, on the band practice field, and in the grassy lot at the corner of Lincolnway East and Reynolds. In addition to the handicapped parking spots in the parking lot, there will also be handicapped parking available in the circle drive in front of GHS (on the east U.S. 33 side of the building). 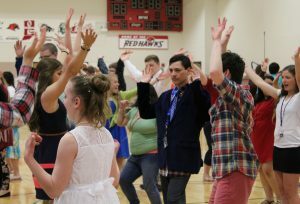 The GHS administration has asked that all guests with tickets be in their seats in the gym by 1:45 p.m. No guests will be allowed into the gym just before 2:00, as staff will be preparing for the faculty entrance and then for the graduate processional. In order to ensure that you are seated for the processional, you must arrive early. The GHS Administration has requested that families do not bring strollers or car seats into the school during graduation. Also, as in recent years, the following items will not be allowed into the school during graduation: Balloons, food, flowers, stuffed animals, noisemakers of any kind. Large bags or parcels may be subject to search; if in doubt, please leave large bags at home. If you have questions or concerns about this information, you may call the high school at 533-8651. Lifeguarding classes begin THIS week at the Aquatic Center. If you are interested in becoming a lifeguard, need recertified or are interested in a summer job, check out the Aquatic Center website at aquatics.goshenschools.org. Thank you to everyone who has signed up for this Friday’s blood drive. Please make sure to check your email for important information. If anyone else would still like to sign-up, see Mrs. Clark in room 2280. Triton defeated the boys varsity golf team at Stone Henge CC in Warsaw 181-219. Goshen was led by junior Peyton Cripe who was the match low medalist with an impressive 40 (4 over). William Troyer shot 59, Will Gaby 75, Allan Garrett 61 and Gabe Yoder 59. Triton defeated the boys JV golf team 195-304 at Stone Henge CC in Warsaw. Goshen was led by Don Perry with a 59, Jake Jennette 62, Derrick Stotts 64, Ben Schneider 60 and Joseph Narayan 64. The girls track team beat Wawasee 75-57 and Plymouth 69-63 to even their conference record at 2-2 and improve their overall record to 6-2. Goshen was led by Jill Kissinger’s 2nd place finish in the 100m hurdles and 1st place finish in the 300m hurdles, Remya Johnson’s 1st place finish in the 100m, Jocelyn Valderrama’s 2nd place finish in the 1600, Ashley Sanchez-Gonzalez’s 3rd place finish in the 1600 and 3rd place finish in the 3200, Brandi Smith’s 2nd place finish in the 400m and 2nd place finish in the 200m, Monse Rodriguez’s 1st place finish in the high jump, Kyrah Fletcher’s 2nd place finish in the long jump, Kassandra Rodriguez’s 3rd place finish in the shot put, Suzette Rodriguez’s 3rd place finish in the discus, Kayleigh McKee’s 2nd place finish in the pole vault, Alayna Yoder’s 3rd place finish in the 200m, and Ariana Perez Diener’s 2nd place finish in the 3200m. The girls JV and varsity softball teams will host Warsaw at 5:15 p.m. The boys JV and varsity baseball teams will play at Warsaw at 5:30 p.m.
Congratulations to Matthew Herrmann, Cheyenne Kalb and Nathanael Wertz for having their building designs chosen as state finalists in the very challenging and competitive, annual AIA Architectural Design Contest! 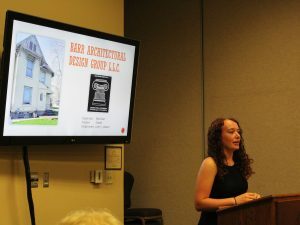 Their design boards will be on display in the Indianapolis Arts Garden in Circle Centre Mall-downtown Indianapolis, from April 25th until the final awards ceremony on May 5th. The girls JV softball team won big against Northridge, 21-4. Gabby Ott had three hits, two RBI’s and five runs. Devin Shipley had three hits while Nicki Kowalenko added two hits. Grace Vance got the win in the circle. The boys varsity baseball team lost to Northridge 5-3. The RedHawks were down early 5-0 after three innings but got great relief outings from Chase Knoblock for two innings and Michael Pinarski for two and battled back to 5-3. The RedHawks had the tying run on base in the 7th but were unable to get him in. Michael Pinarski had two singles and Charlie Collins had a double. The boys JV baseball team opened up their conference season with a home loss to the Northridge Raiders, dropping the game 16-6. Although Braxton Kincaid did not get a hit, he walked three times and scored two runs. Jack Immel chipped in three hits and two RBI’s leading the offense. Yamil Rivera pitched 2-1/3 innings of relief for the RedHawks after they fell behind early. The girls varsity softball team won their conference opener against Northridge, 4-3. AnaMaria Ramirez went three for four with two RBI’s while Kate Atkinson added two hits and her first career homerun. Ashton Darnell also added two hits while driving one run. Kate Atkinson got the win in the pitching circle. Boys varsity golf will travel to Stonehenge to compete against Triton at 5:00 p.m. The girls JV and varsity tennis teams will play at Northridge at 5:00 p.m. The girls JV and varsity track and field teams will face off against Plymouth and Wawasee at 5:30 p.m. in Plymouth. Welcome back…..We hope that you enjoyed the long weekend! Cheyenne Kalb had a straight-sets win at 2 Singles for the short-handed RedHawks as the varsity girls tennis team lost 1-4. Sage Christner and Sophia Kellenberger at 1 Doubles scored the lone point for JV with a 6-3, 6-4 score. Elkhart Central defeated Goshen in varsity golf 187-205 at Christiana Creek in Elkhart. Goshen was led by Will Troyer with a 48, Jake Jennette fired a 50, Peyton Cripe shot 51, Allan Garratt shot 54 and Will Gaby shot 55. Elkhart Central JV defeated the boys JV golf team 216-229 at Christiana Creek CC. Goshen was led by Ian Schreiner-Barger who shot a 52, Ben Schneider fired a 53, Gabe Yoder 56, Joseph Narayan fired a 68 and Don Perry shot 69. The boys JV baseball team won a thriller at Phend Field against New Prairie by a score of 5-0. Bryce Smith and Bryant Robinson combined for a shutout against New Prairie. Although it took the bats six innings to produce a run, when the RedHawk offense struck, they busted out for five runs. Jack Immel, Bryce Smith, Jocsan Sanchez, Porter Revoir and Bryant Robinson all had RBI’s in the 6th inning. The boys varsity baseball team suffered their first loss of the season in a close well-played game Thursday night against New Prairie, 3-2. Joey Peebles suffered the loss throwing 4 2/3 innings striking out six and walking two. Offensive leaders were Charlie Collins with a single and a double. Austin Bontrager and Philip Wertz each doubles. The girls varsity softball team lost against Triton 5-9. Elkah DeVoe, AnaMaria Ramirez, Caitlyn Doyle, Shelby Yoder and Sara Breniser each added a hit a piece for Goshen. Caitlyn Doyle also added two RBI’s. The boys JV golf team competed in the Rochester JV Invitational at Round Barn Golf Course in Rochester on Saturday. The team was led by Ben Schneider who fired a 114, Derrick Stotts shot 121, Gabe Yoder shot 122, Joseph Narayan fired a 134 and Don Perry shot 136. CMA won the event. The girls varsity softball team beat Fairfield 6-4. Elkah DeVoe had three hits, two RBI’s and five stolen bases. Alexia Nettrouer hit her first career homerun while driving in two runs. Kate Atkinson was the winning pitcher only allowing seven hits. The girls JV softball team suffered a tough loss against the Falcons, 7-5. Grace Vance pitched a good game allowing only six hits and striking out six. Gabby Ott had two doubles while Breanna Boocher had a double and two RBI’s. The boys JV baseball team dropped Game 1 of the double header against LaPorte after battling back from multiple deficits. Bryant Robinson and Drew Marlow each hit their first home run of the season. Braxton Kincaid pitched a great game giving up only three earned runs. The RedHawks fell behind early and battled back coming up just too short. The final score was 11-9. The boys varsity baseball team defeated LaPorte 4-1. Tyler Colpitts threw a seven inning complete game to move to 3-0 on the mound this season. Colpitts also had two hits and an RBI. Charlie Collins also contributed two hits. They lost in the 2nd game 6-1. Charlie Collins led the offense with a single and a double. Five RedHawk pitchers (Austin Cain 3, Phil Wertz, Chase Knoblock, Michael Pinarski, and Mitchell Walters all 1) combined to give up only two earned runs but it wasn’t enough as three unearned runs scored due to RedHawk errors. The boys varsity golf team was led by Peyton Cripe with an 88, William Troyer 99, Allan Garratt 101 and Will Gaby 111. Jake Jennette had to withdraw because of health reasons. Plymouth won the event with a team score of 325. Fairfield finished 2nd with a team score of 331. The girls tennis team finished 4th at the Goshen Round Robin. Lineth Alvarez-Barrera and Cheyenne Kalb each went 2-0 on the day. Claire Penner and Kayleigh Crowder also got wins in the tourney. The boys JV and varsity baseball teams will host Northridge at 5:00 p.m. The girls JV and varsity softball teams will play at Northridge at 5:00 p.m.
NO SCHOOL TOMORROW – Enjoy the long weekend and we will see you on Monday! Seniors: If you still need to order a cap and gown you can visit their web site at www.highschool.herffjones.com to place an order. They will also be here TODAY during the lunch periods. Cap & Gown delivery day will be on May 2nd during SRT. This semester’s blood drive will be Friday, April 21st and sign-ups are happening now in social studies classes. See Mrs. Clark in room 2280 if you have any questions. Attention Students and Staff: Key Club is collecting travel-sized soap, shampoo and conditioner for families at Riley Hospital. If you traveled over Spring Break and have leftover personal items, you may bring them to the guidance office THIS WEEK to be donated. Lifeguarding classes begin next week at the Aquatic Center. If you are interested in becoming a lifeguard, need recertified or are interested in a summer job, check out the Aquatic Center website at aquatics.goshenschools.org or call the Aquatic Center at 533-3201 for more information. IHSAA Student-Athlete Tip of the Week: High school athletes play sports for a variety of reasons. I would say very few participate to achieve fame and fortune. In fact, I would venture to say that you might feel uncomfortable if stardom came your way. The World Series champion and National League MVP would be right there with you. This young, successful baseball phenome cares about his image and what he can do to make others feel comfortable around him. Whether you are Kris Bryant the MVP or the local player at your high school, there is no greater trait than humility. Kris recently said in Sports Illustrated that he wants people in public to see his personality, that he’s a nice guy and it’s good karma that comes back to you. Treat people with kindness and it all comes back to you. When success comes your way it is OK to revel in the moment, but don’t forget the image that Kris Bryant portrays. Those around you will be glad you did! 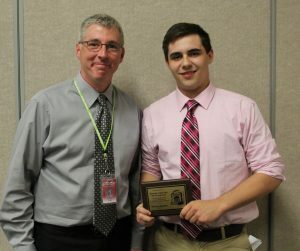 The guidance office has received new scholarships. Please stop in for application information! 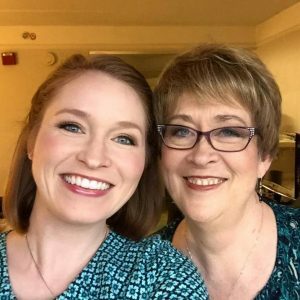 The Carol Rhinehart Scholarship is open to any student that is pursuing a college degree in the medical field (nursing, pharmacy, pre-med, etc). It is due April 30th and as of now, they haven’t received any applications from local schools. They have $2500 to give away and no one to give it to! Please stop in guidance, pick up an application and get it sent in if you plan on furthering your education in the medical field. 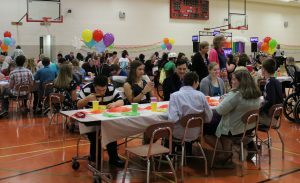 Stay In Bounds Ambassadors will meet TODAY during the 2nd session of SRT in the main gym. See Mr. Kissinger in advance if you cannot make the meeting! The girls varsity softball team won a big game at Elkhart Central, 8-6. Jordan Nemeth had four hits and one triple. Kate Atkinson added two hits while driving in three runs. Gracie Hayes also had two hits and drove in two runs. The girls JV softball team defeated Elkhart Central 17-5. Ruth Whitehead pitched for the win while adding two hits. Alexis Navarro had four hits with four RBI’s and also scored four times. Gabby Ott had two hits and drove in two runs. The boys baseball C team opened their season with a 9-4 loss to Elkhart Memorial. Mason Schrock led the RedHawk offense with two hits and one RBI. James Troyer also had a double and scored a run for the RedHawks. Jocsan Sanchez pitched four innings and gave up three earned runs for the RedHawks. The girls JV and varsity tennis teams will host Wawasee at 4:30 p.m. The boys JV and varsity golf teams will compete at Christiana Creek against Elkhart Central at 5:00 p.m. The boys JV and varsity track and field teams will host Northridge and Northwood at 5:00 p.m. The boys varsity baseball team will play at New Prairie at 5:30 p.m. The boys JV baseball team will host New Prairie at 5:30 p.m. The girls varsity softball team will host Triton at 5:30 p.m. The boys C baseball team will play at Tippecanoe Valley at 5:30 p.m. The girls varsity track and field team will compete in the Carmon Cripe Relays at 9:15 a.m. The girls JV and varsity softball teams will host Fairfield. Varsity plays at 10:00 a.m., followed by JV at noon. The boys JV and varsity baseball teams will host a double header vs. LaPorte starting at 11:00 a.m.
GHS Science teacher, Andy Brubaker: Upon receiving a 2017 Teacher Creativity Fellowship grant. He will use the funds for a biking trip on the Colorado trail. He will be taking the trip with a friend. While on the trip, they will volunteer for the foundation that maintains the trail, as they want to do something to give back. The idea behind the project is sustainability, and he will make a video after the trip to report on it. 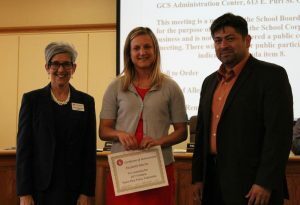 GMS Master teacher Liz Martin: For receiving a Teach Plus Policy Fellowship. 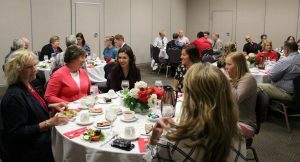 The fellowship is a group of Indiana teachers who want to connect with state legislators and work with them on school policies. 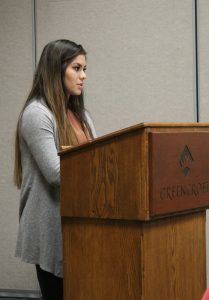 Ms. Martin stated that she met Dr. McCormick, in February, and she has presented to the education committee about the importance of mentoring new teachers. She stated that the legislative committee asked her a lot about TAP. 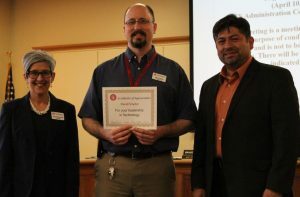 Technology Director Dave Snyder: For leadership in Technology. 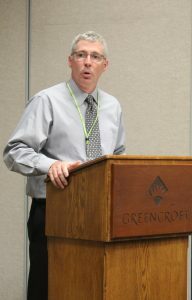 Mr. Snyder was recently featured in a national publication for K-12 educational technology. Mr. Snyder and the whole technology department have been diligently working with the schools as GCS implements the 1:1 computer initiative corporation-wide. The GHS Varsity Winter Guard: For their poise under pressure, as their music cut out completely during their show in Pittsburgh. 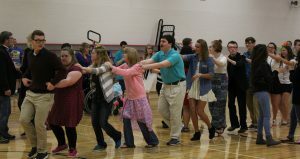 The students continued their show in silence, and earned the enthusiastic support of the crowd. Calling all supporters of Goshen Community Schools!! We invite you to participate in next week’s Good of Goshen Photo Challenge, during the week of April 17-21. Please see below for details. We can’t wait to see you chronicle your great RedHawk Pride!! At the end of the week, the photos will be judged by the Good of Goshen team. The winner will get to see their winning photo as the Good of Goshen’s Facebook and Twitter cover photo for an entire month, and will receive a $25 gift card to a local business of their choice! April: #RedHawkPride Contest Dates: April 17 – 21 Let’s gooooo Hawks! 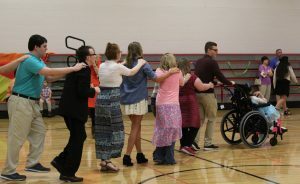 Share your photos that relate to Goshen Community Schools. Whether it be at athletic events, school plays, concerts, field trips, or portraits of teachers or students, we invite you to show us your RedHawk pride. 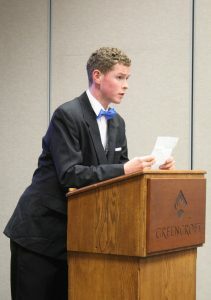 Branden Beachy is an amazing photographer (photo above), but don’t let him be the automatic winner, GCS. Participate!! Let’s see your RedHawk pride! On Monday evening, Goshen Community Schools lost long-time orchestra teacher/director Susan Ellington to cancer. 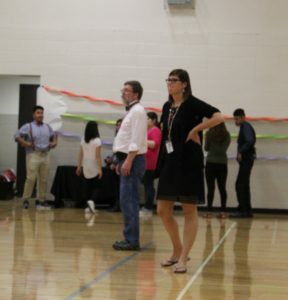 There have been many tributes by former students and GHS faculty members on social media, and many expressions of support for Susan’s family. Susan was very special, and she will most certainly be missed. 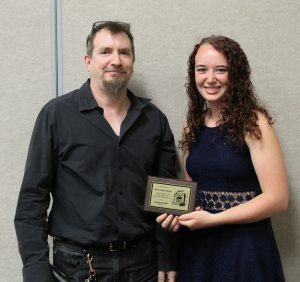 We take comfort in the fact that her love of music and people has been instilled in the hearts and minds of many students, and that her love will continue to grow through others. We weren’t the brightest students in the world, though we liked to think we were. We weren’t the best instrumentalists either. Trust me, if you’ve heard Carmel HS in Indianapolis play at ISSMA competition, you know that to be true. But there is something that we all had that we knew was special. We had Susan Ellington. In all my years of playing in orchestra in Goshen Community Schools, I never had a director quite like Mrs. Ellington. She was kind, fiercely passionate, and she never gave up on her students. Each one was precious, and each one had a gift. She believed in the power of music to bring students of all backgrounds together. No, we weren’t always perfectly in tune. Sometimes the first violin section would muddle through a phrase of particularly challenging 16th notes, and play very confidently on the cadence of the phrase. Mrs. Ellington always pushed us to be the best that we could be, but at the end of the day, we were creating something special together. It didn’t have to be perfect for her to be proud of the work we had done. We were all beautifully flawed people coming together to work towards a common goal. Mrs. Ellington has done so much for music education, and thousands of students have been impacted by her work. Brava, Susan. You will be missed, but we celebrate your life through song and fond memories. Written by GHS graduate Emma Roth. Visitation will be at Yoder-Culp Funeral Home (1911 S. Main Street, Goshen, IN) on Friday, April 14 from 2:00-4:00 pm and 6:00-8:00 pm. Celebration of Life on Saturday, April 15 at 1:00pm at Eighth Street Mennonite Church (602 S. 8th Street, Goshen, IN) with graveside service immediately following at Chapel Hill Memorial Gardens. Memorial contributions may be directed to the Elkhart County Symphony at P.O. Box 144, Elkhart, IN 46515. Isn’t there a kind of sample brotherhood in the making of music? Just a sample, under conditions that are transitory. But one which might grow if it could be remembered and nurtured? Making music together is hard work that is fun. Making music together creates a kind of brotherhood where failure is everybody’s loss. Where success is a victory for all, where differences and inherited beliefs have no relevance. and remembering, wish the world could be like that, forever. Seniors: If you still need to order a cap and gown you can visit their web site at www.highschool.herffjones.com to place an order. They will also be here TOMORROW during the lunch periods. Cap & Gown delivery day will be on May 2nd during SRT. GHS is offering an athletic physical exam night for GHS students TONIGHT from 5:30-7:30 p.m. at the new urgent care center on Elkhart Rd. All students interested MUST sign up for an appointment time in advance with Mrs. Schrock in the GHS athletic office and pay $20 in advance. If you cannot pay the $20, please see Mr. Kissinger for scholarship opportunities. This is a great opportunity to complete your physical exam for the 2017-18 school year. Stay In Bounds Ambassadors will meet TOMORROW during the 2nd session of SRT in the main gym. See Mr. Kissinger in advance if you cannot make the meeting! The boys varsity baseball team defeated Jimtown 10-0. Tyler Colpitts threw a complete game five inning shutout and no hitter due to the ten run rule. He struck out six and walked three. Austin Bontrager hit a three run homer in the first inning and Robbie Riegsecker and Trenton Scott both had singles and two RBI’s. The boys varsity golf team hosted Elkhart Memorial, Lakeland and West Noble at Maplecrest. Goshen scorers included: Peyton Cripe 47, William Troyer 49, Jake Jennette 54, Gabe Yoder 56 and Will Gaby 59. The girls varsity softball team defeated Bethany 12-5. Caitlyn Doyle collected her 2nd win in the pitching circle while adding three RBI’s at the plate. Elkah DeVoe, Alexia Nettrouer and AnaMaria Ramirez each had three hits for the RedHawks. Kate Atkinson also had two hits with four RBI’s. Jimtown handed the boys JV baseball team their second straight loss by a score of 10-5 at Phend Field. Although the RedHawks came back from a 5-0 deficit to tie the game, their efforts weren’t enough as Jimtown answered the comeback with five unanswered runs. The RedHawks offense struggled, but were led by Jocsan Sanchez who had a double and three RBI’s in the game. The girls track team lost to Warsaw and Northridge in their conference opener. Goshen was led by Jill Kissinger’s 1st place finish in the 100m Hurdles, 2nd place finish in the long jump and 3rd place finish in the 800, Jocelyn Valderrama’s 3rd place finish in the 1600, Brandi Smith’s 5th place finish in the 400, Kayleigh McKee’s 5th place finishes in the pole vault and 300m Hurdles, Ariana Perez Diener’s 5th place finish in the 3200, Suzette Rodriguez’s 3rd place finish in the discus and 5th place finish in the shot put, Riley Martin’s 4th place finish in the discus and Kassandra Rodriguez’s 2nd place finish in the shot put and 5th place finish in the discus. The girls JV and varsity softball teams will play at Elkhart Central at 5:00 p.m. The boys C baseball team will play at Elkhart Memorial at 5:30 p.m.